KANSAS CITY, Kan. — Many parents are concerned that their children will grow up and leave the Catholic faith — and they should be. According to a 2015 Pew Research Center study, 52 percent of all Catholics have left the church at some point in their lives . . . and only 11 percent return. And according to a 2018 study by St. Mary’s Press and the Center for Applied Research in the Apostolate, 74 percent of 214 former Catholics interviewed left the church between 10 and 20 years of age. “We know that we have to earn our kids’ trust and build the lifelong connection that we want them to have with the church earlier and earlier,” said Deacon Dana Nearmyer, evangelization division secretary for the archdiocese. There is no “silver bullet” that will solve this problem. 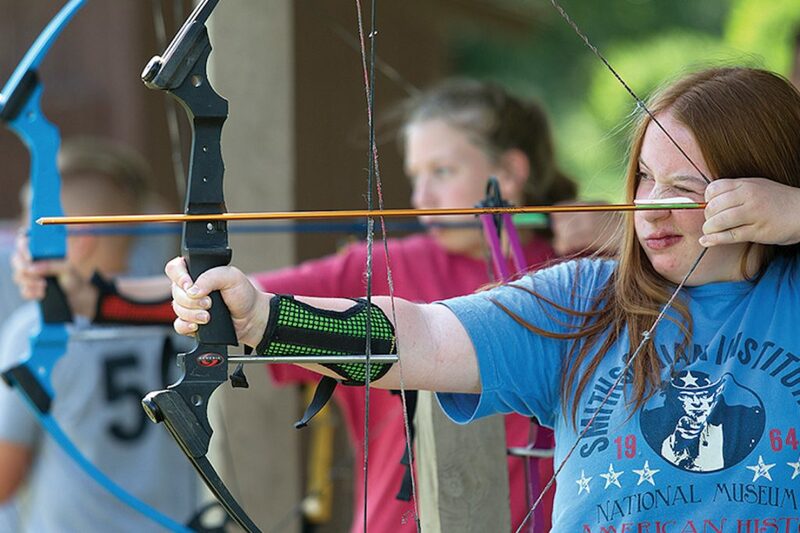 But the Archdiocese of Kansas City in Kansas has a powerful tool to help keep kids Catholic: Camp Kateri Tekakwitha at Prairie Star Ranch in Williamsburg. “Camp Tekakwitha is designed to reinforce kids’ faith in exactly the struggle points that they are at,” said Deacon Nearmyer, executive director of the camps with his wife Debra. “The reason we have separate camps for fifth- and sixth-graders, and separate camps for seventh- and eighth-graders, and high school camps, is because we want to meet them and the key questions they have based on their age,” he said. “We make the Masses, the prayer experiences and Bible studies extremely fun and memorable. And with all the activities — rope courses, climbing tower, horses, mountain boards and bikes — the church is represented in deep, meaningful content that is age-appropriate and gives them an experience of fun, faith and friends,” said Deacon Nearmyer. A lot of the upcoming adult initiatives have been integrated into this summer’s camp curriculum, including cutting-edge evangelization tools, he said. This was very successful. Already, camps slots are 51 percent full. Even so, there are spaces still available for most camps — but they won’t last long. Last year, the camp hosted 1,650 campers. Usually, every new camping season brings a new feature or “tweak” to programing or facilities. This year, the Trinity bunkhouse for boys features new bathrooms and a new roof. The “hanger” area also boasts all new lighting. Last year, the new feature was Family Camp for families having members with special needs. This camp featured “camp buddies,” who support family members with disabilities. They helped them engage in activities separate from their parents and siblings, but also with parents and siblings for group activities. The facilities and programing are important components, but what really makes the camp work is its cadre of camp counselors. Probably the greatest endorsements of the camp come from its alumni, who return to become counselors because they were inspired by their counselors while they were campers. “Parents tell me all the time that their kids, in their 20s and 30s, attribute their time at camp as one of the great reasons why they were able to navigate their college and young adult years and remain in the faith,” said Deacon Nearmyer.